One week after his AE 2012 vs. SFxT 2013 combo video, Desk has added 3rd Strike to the fracas. Watch top notch combos from all three games inside. Desk has posted a new combo video featuring three Street Fighter games. 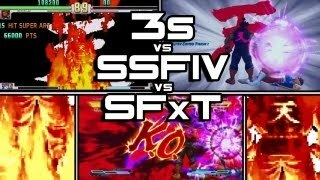 Last week he made a Super Street Fighter IV: Arcade Edition 2012 vs. Street Fighter x Tekken 2013 clip. Now he has added Street Fighter III: 3rd Strike. The uploader notes that he will be adding a new game to these videos until space has run out.